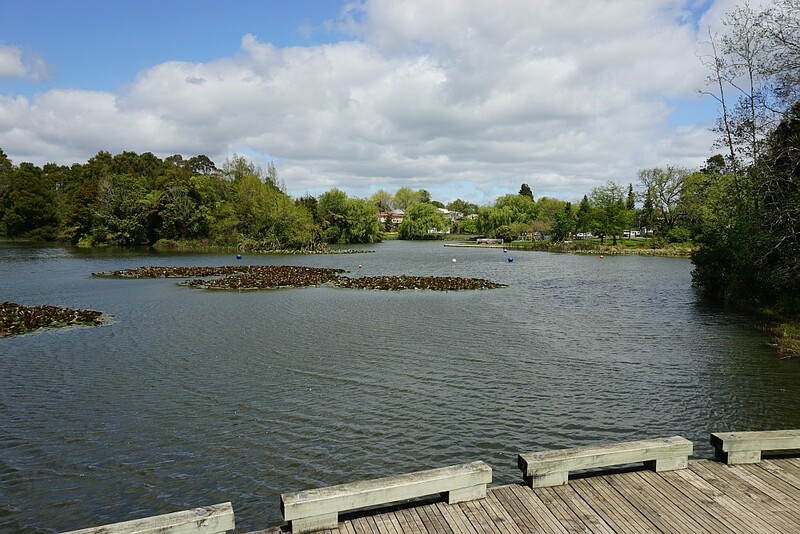 There are public toilets by the parking area in Gilmour Reserve, alongside Gilmour Lake. Dogs on a leash are allowed on the walkways. The area around Mill Stream and Union Hill was once mined for gold, and there are information panels along the walkway showing locations and remains from the mining operations. 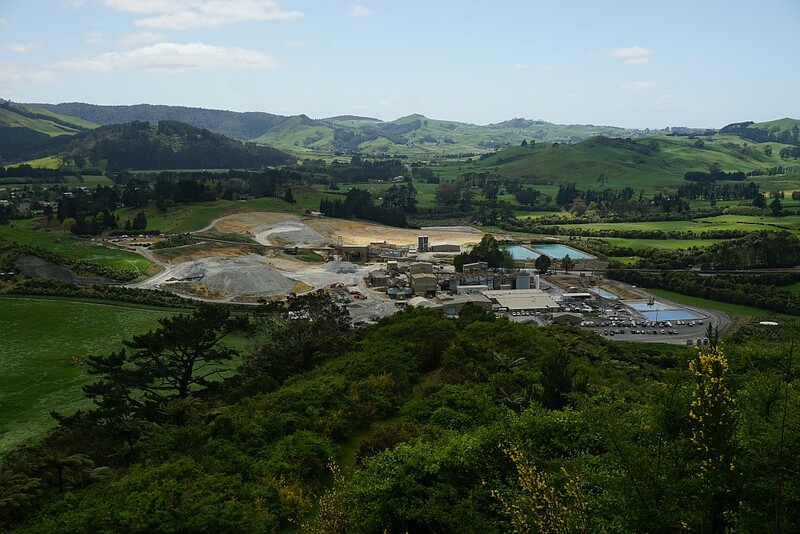 Underground gold mining is currently being undertaken in the area, with the Trio Mine under Union Hill, and the planned Correnso Mine below the residential areas of Waihi East. The Martha open pit mine is currently not operational. 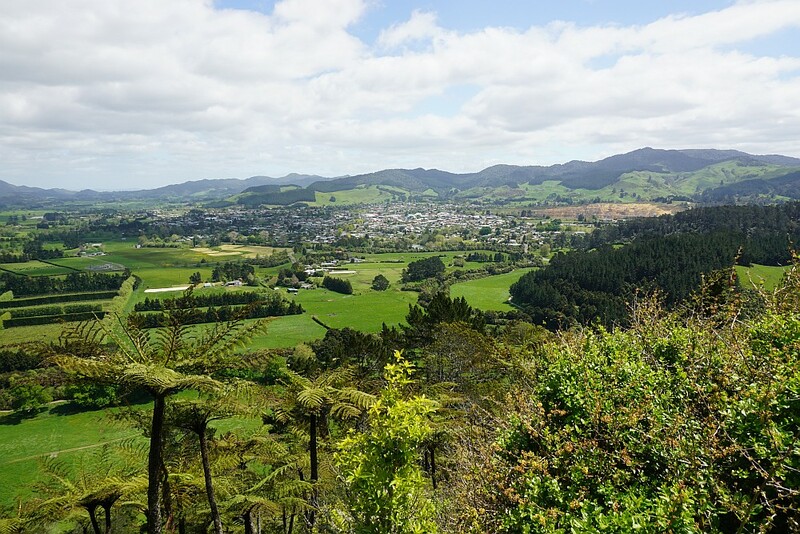 When underground mining originally ended in 1952 there were about 175 km of underground mine tunnels around Waihi. In 2014 the Favona (now closed) and Trio mines had a total of about 37 km of tunnels (or drives). 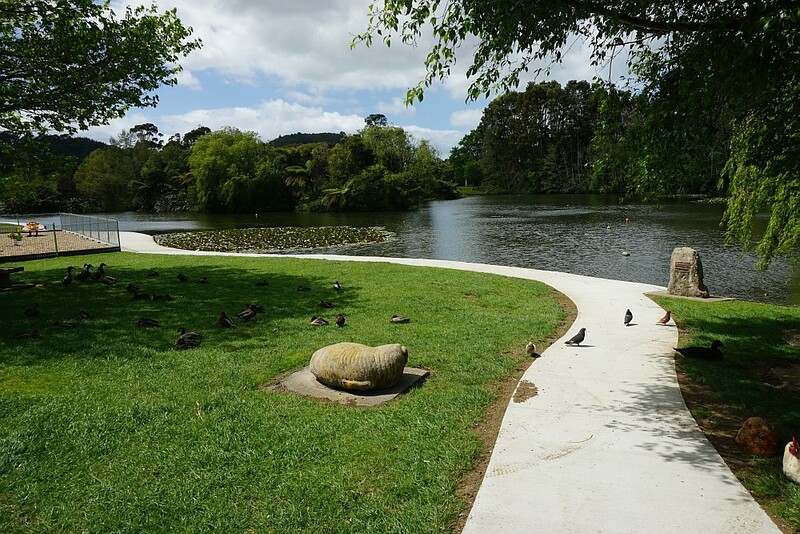 Gilmour Lake, in the Gilmour Reserve, and the start of the walkway. Looking back at the carpark, between the trees on the right, from the north-eastern end of Lake Gilmour. 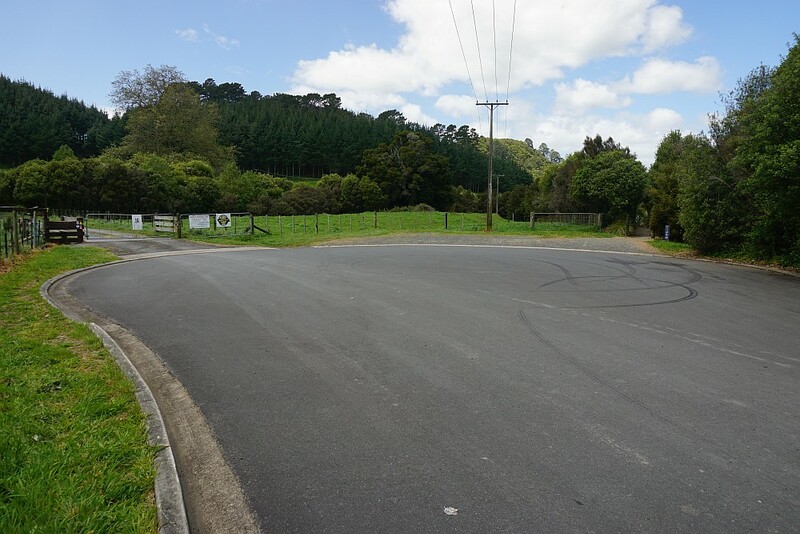 The turning area and the parking area at the end of Clarke Street. The entry to and exit from the mountain bike trails is on the left. The start of the walkway on the right. 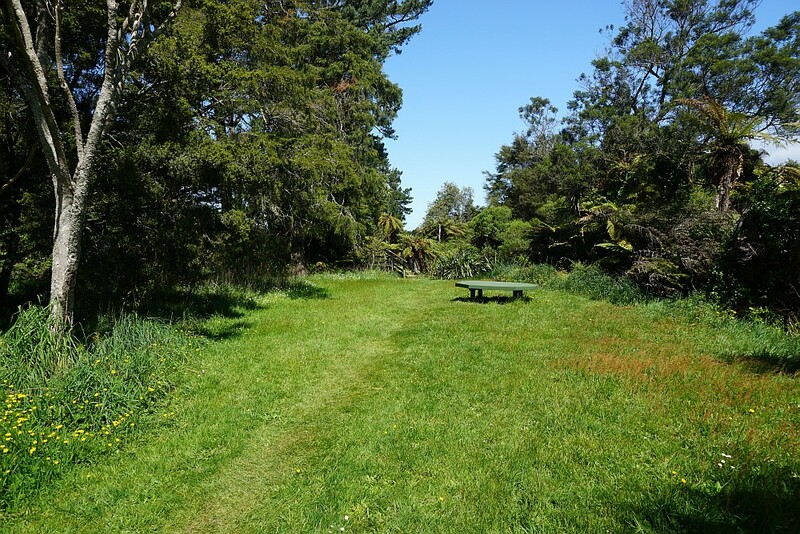 The walkway around the base of Black Hill follows the Ohinemuri River for most of the way. 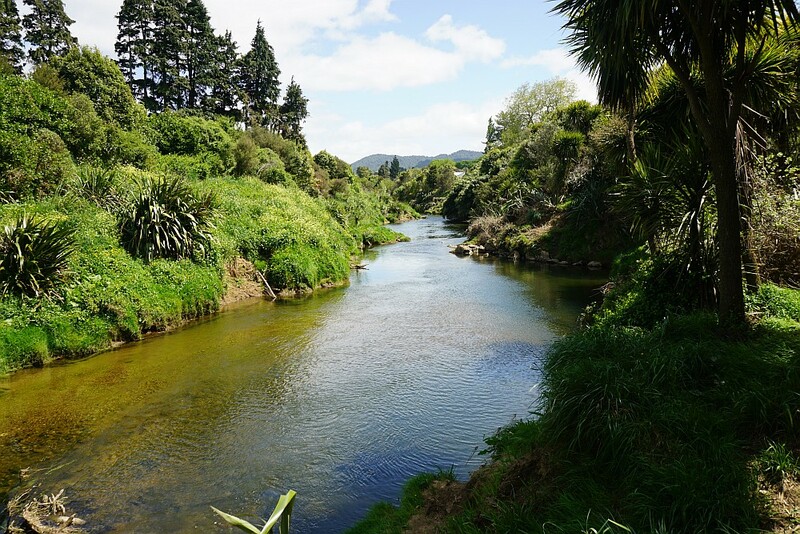 The river continues on through the Karangahake Gorge to Paeroa. 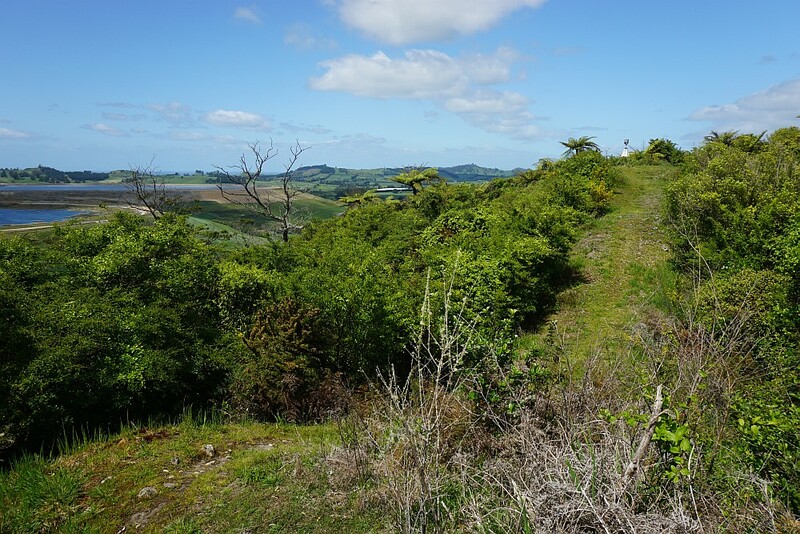 The track to the summit of Black Hill is unformed. The lower part passes through farmland and is marked with yellow posts. The walkway around the hill continues on to the right. 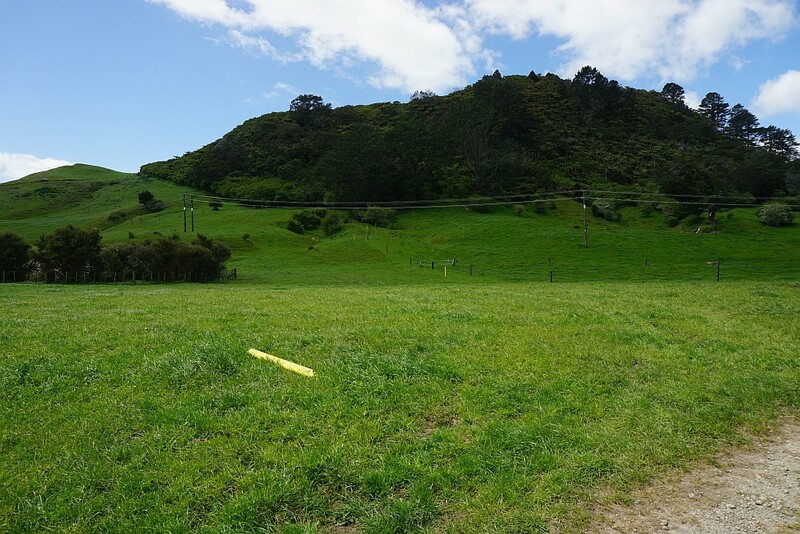 The coloured triangular markers are for the various mountain bike tracks. 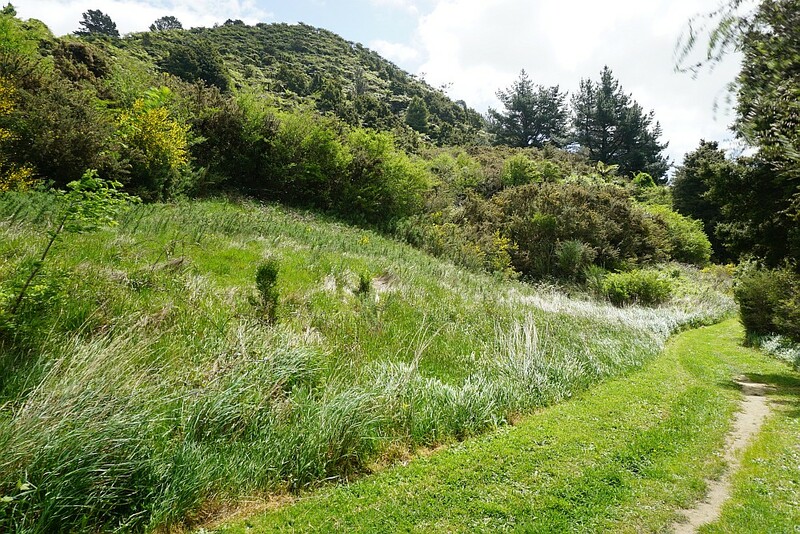 The track to the summit continues along a fenceline, and then along the edge of the bush across the saddle visible to the left. The trig station at the summit of Black Hill, looking from a nearby rocky outcrop. 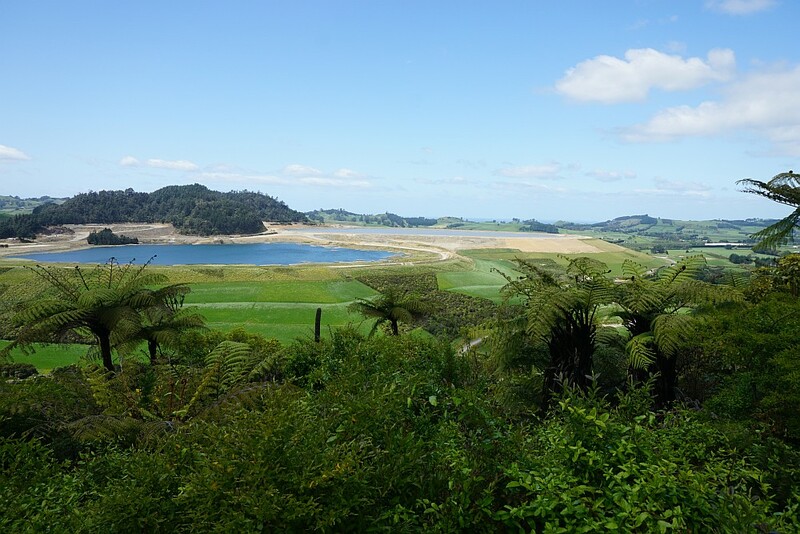 The lakes on the left are held in place by dams formed by mine tailings. 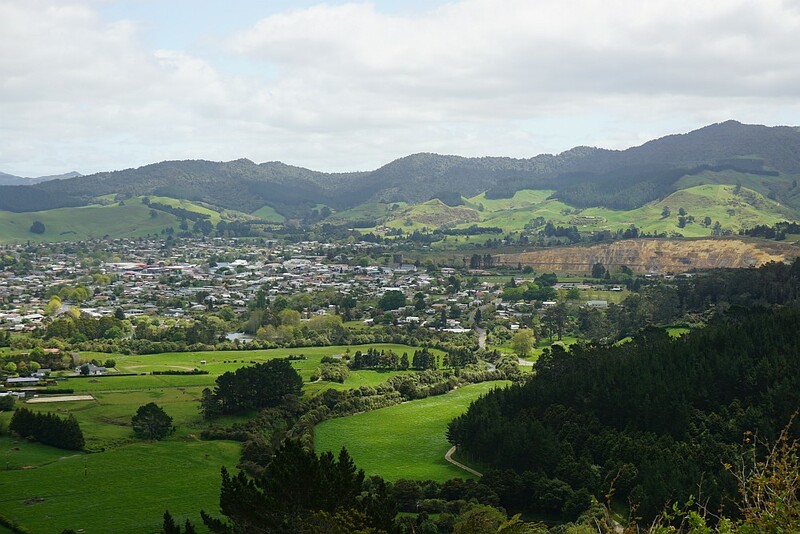 View from Black Hill towards the western part of Waihi township. The rim of the Martha pit mine is visible on the right. A closer look at the town and the Martha Mine. The tailings dams and lakes from the mining operations. The processing plant for the Martha Mine and the underground mines. 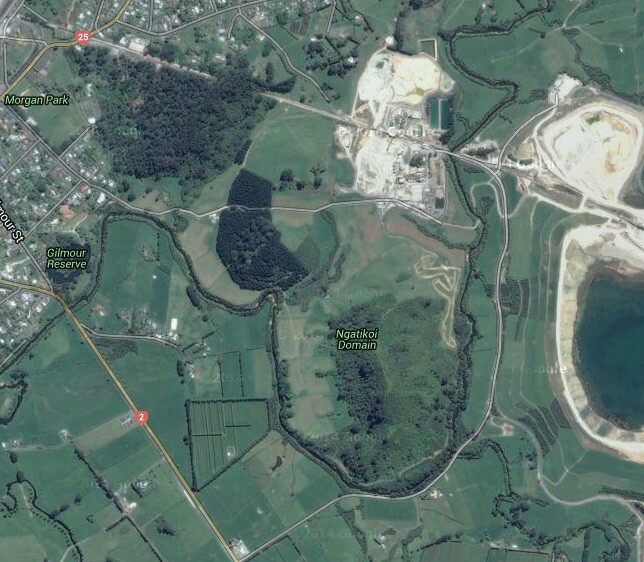 The entrance to the underground mines is on the far left, on the edge of Union Hill. 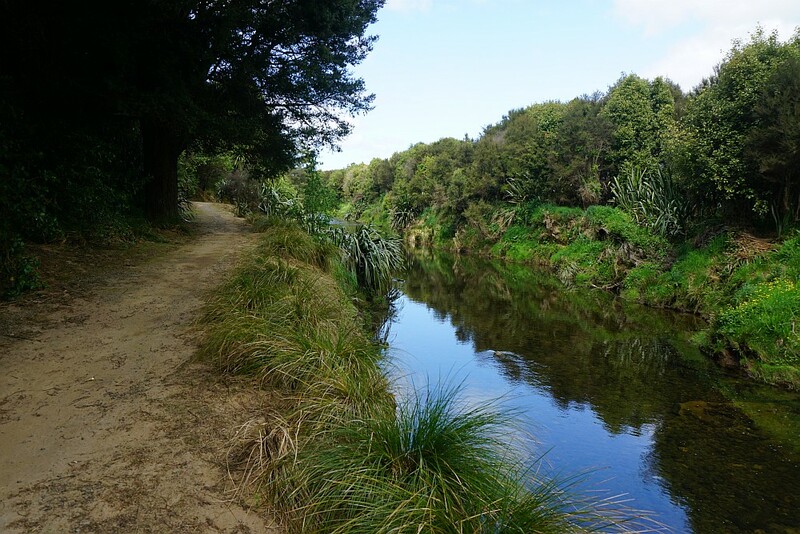 The walkway around Black Hill continues alongside Ohinemuri River. View of Black Hill from the southern side. 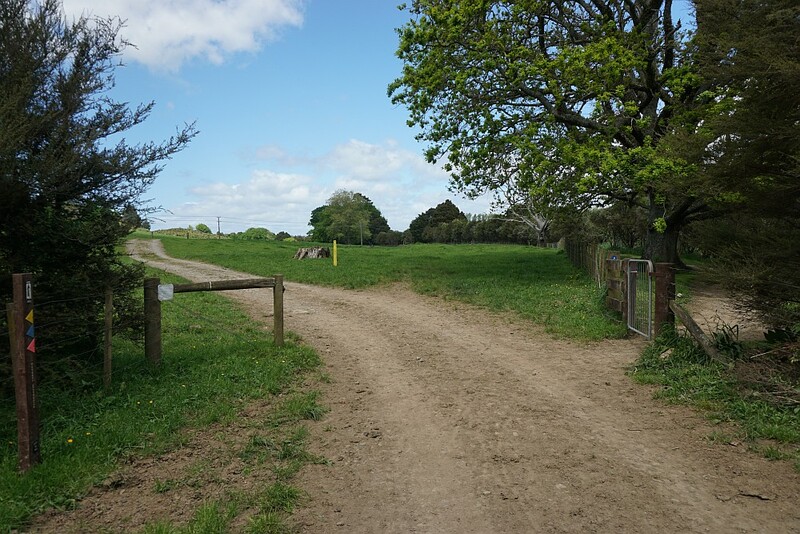 The walkway and cycleway continues on to the right. 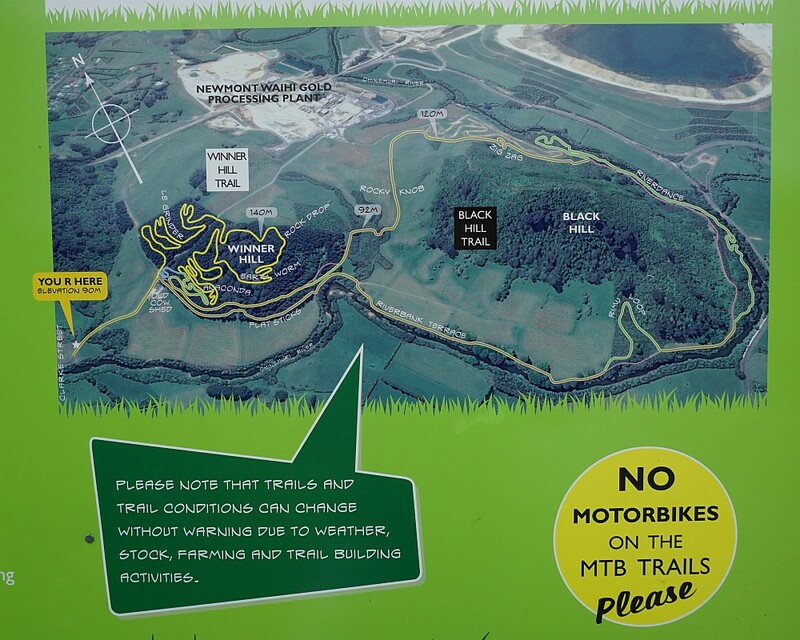 Part of the information panel for mountain bikers at the end of Clarke Street, showing the trails on Winner Hill, and around the base of Black Hill. The walkway alongside the river from Clarke Street is not shown. On the return the walk continued along the MTB track called ‘Flat Sticks’ at the lower edge of Winner Hill. The Mill Stream Walkway can be accessed from Morgan Park on Barry Rd. 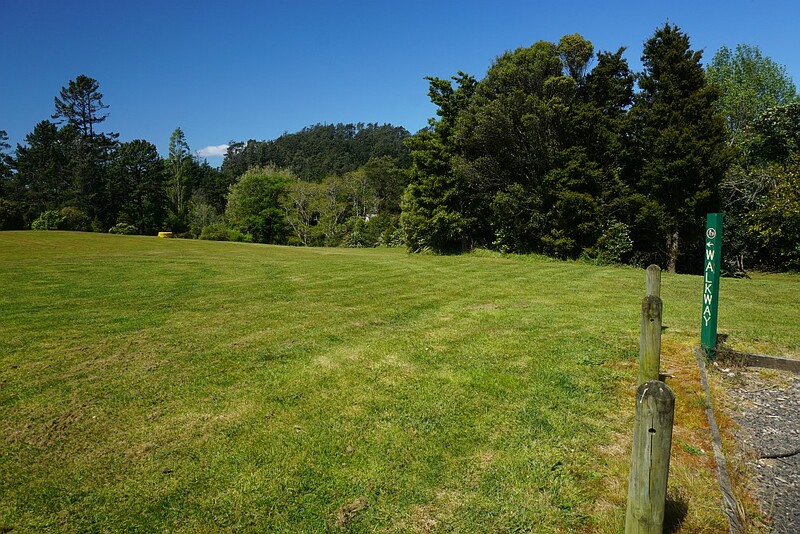 Access is across the grass from the Walkway signpost and then across to the left. 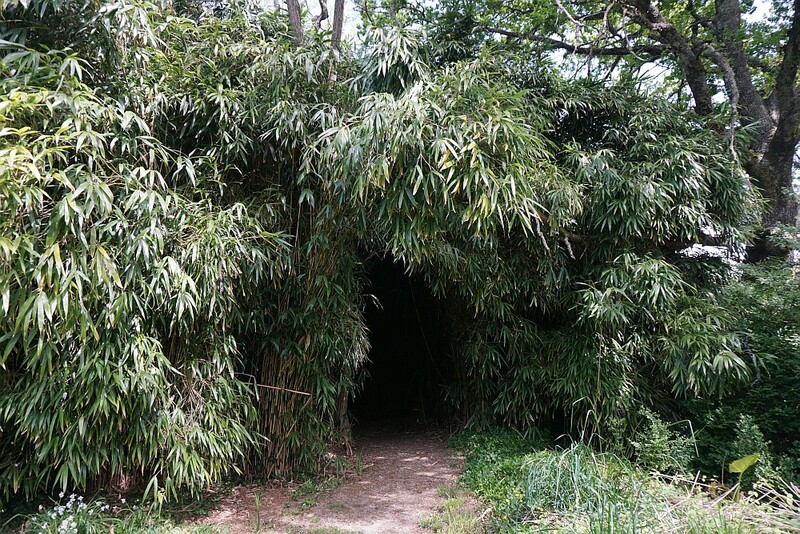 The walkway passes through a very dense stand of bamboo. A pleasant rest area on the Mill Stream Walkway. 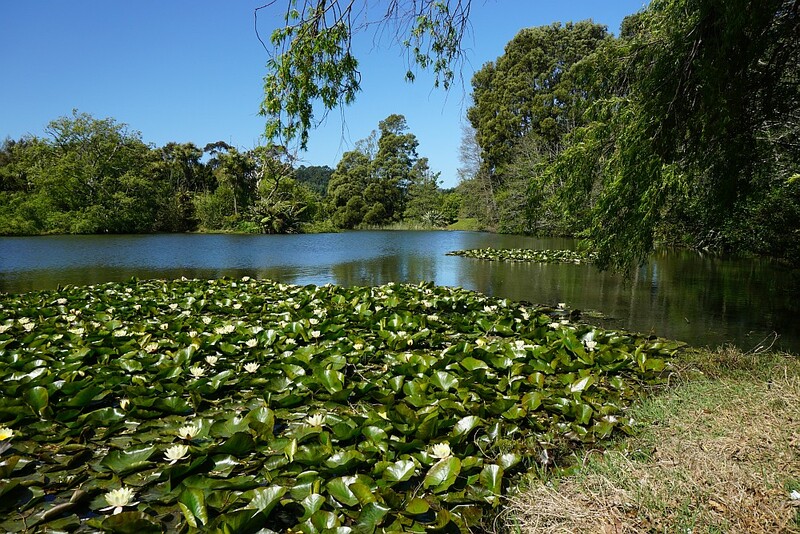 Back at Lake Gilmour, with flowering waterlilies. 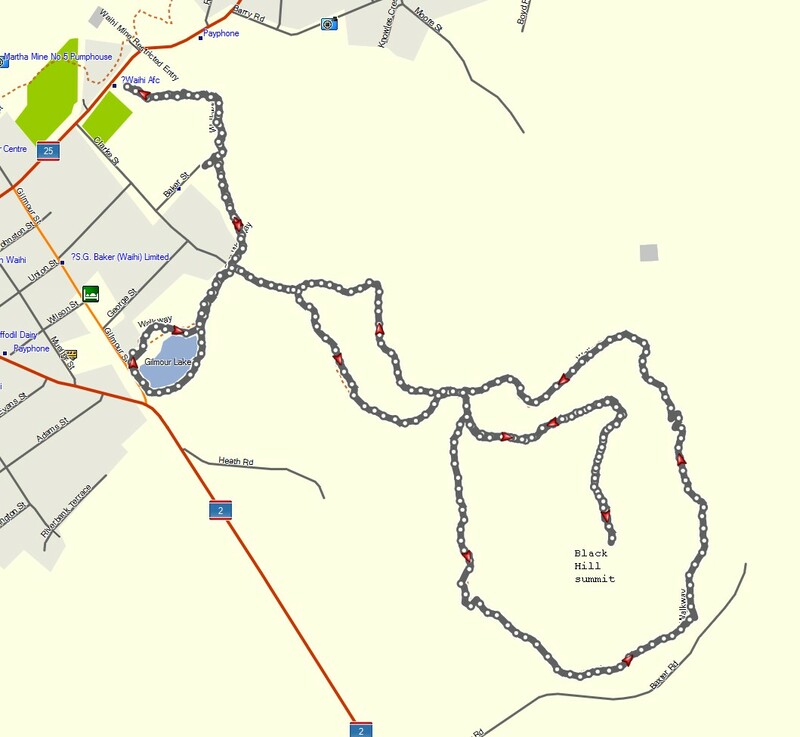 The GPS tracklog shows the route taken, starting at Lake Gilmour, then to Clarke Street, to the summit of Black Hill, anti-clockwise around Black Hill, and then the Flat Sticks MTB track back to Clarke Street. From Clarke Street on the Mill Stream Walkway to Baker Street and Barry Rd, back to Clarke Street, and then to the carpark in Gilmour Reserve by Gilmour Street. Total distance was about 9.3 km, total time 2 hours 30 minutes. The side track to the summit of Black Hill took about 40 minutes, and was about 1.9 km for both directions. The loop around Black Hill from Clarke Street and back to Clarke Street would be about 4.5 km long and would have taken 1 hour. Satellite image from Google Maps of the area covered. The walk was done together with the Martha Mine Pit Rim walk on October 20, 2015.